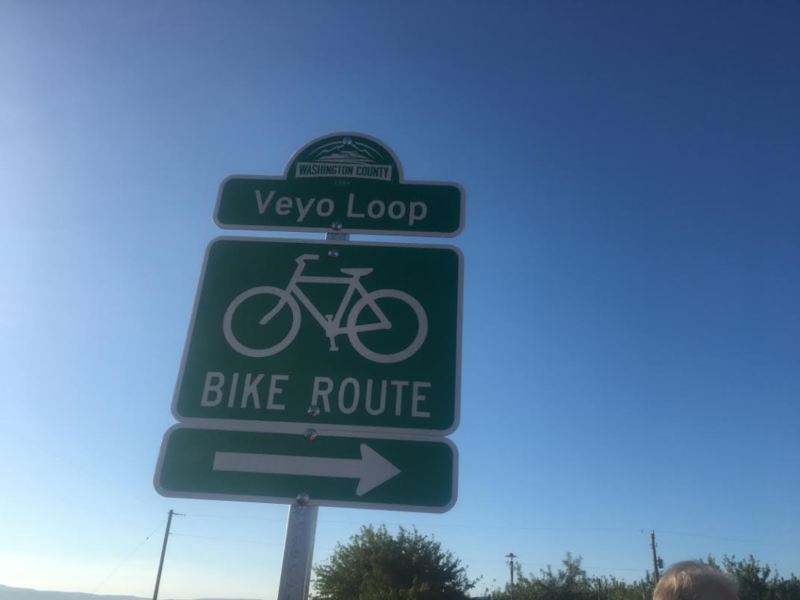 IVINS — Cyclists from throughout Washington County gathered at Unity Park in Ivins Saturday morning to participate in a ribbon-cutting ceremony for the Veyo Loop bike route. A collaboration between the Southern Utah Bicycle Alliance, Road Respect, The Utah Department of Transportation, the Washington County Commission, Washington County Sheriff’s Office and various cities in Washington County, the Veyo Loop was designated as the county’s first official bike route complete with directional signs marking the route. In May, during National Bike Month, Washington County became the first county in the state to receive an official designation as a “County Road Respect Community” — a county that promotes cycling safety and respect between cyclists and motorists. Creating safe bike routes and fostering good relations between drivers and cyclists are important qualifications to becoming a “Road Respect Community.” The Veyo Loop designation is part of Washington County’s commitment to creating a two-way street of respect between motorists and cyclists. “The main thing with the goal of road respect is for education purposes,” Washington County Commissioner Zachary Renstrom, said. Road respect education is twofold: one, to educate motorists to be aware of cyclists on the road, to know that they do have a right to be there and to give them proper space; and two, to educate cyclists to be respectful on the roads and to know and understand the laws. Cyclists at the ribbon-cutting participated in an inaugural ride of the officially designated Veyo Loop. 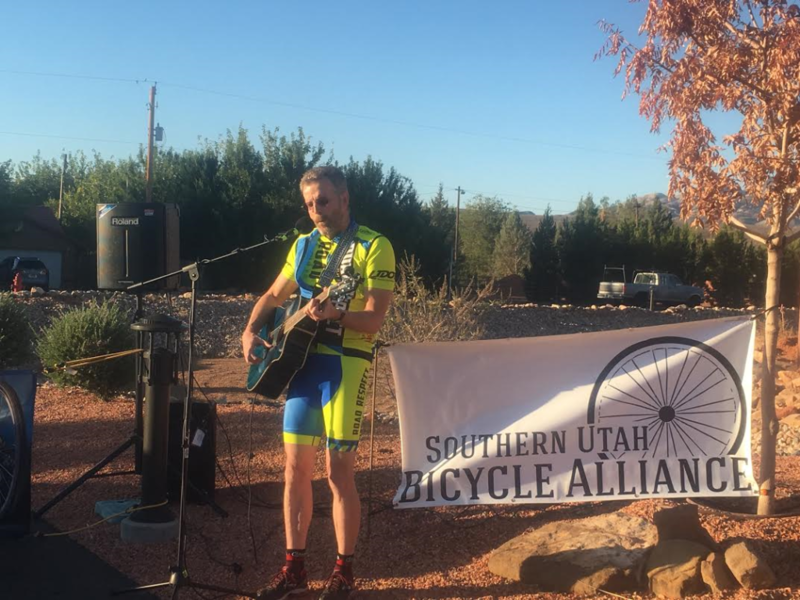 Before they pedaled off, Southern Utah Bicycle Alliance secretary Kai Reed implored them to be ambassadors for all other cyclists. “Let’s prove our point that cyclists and motorists can share the road,” Reed said. The basic Veyo Loop begins in Ivins, then travels toward Gunlock Reservoir and rises above the town of Gunlock to Veyo. 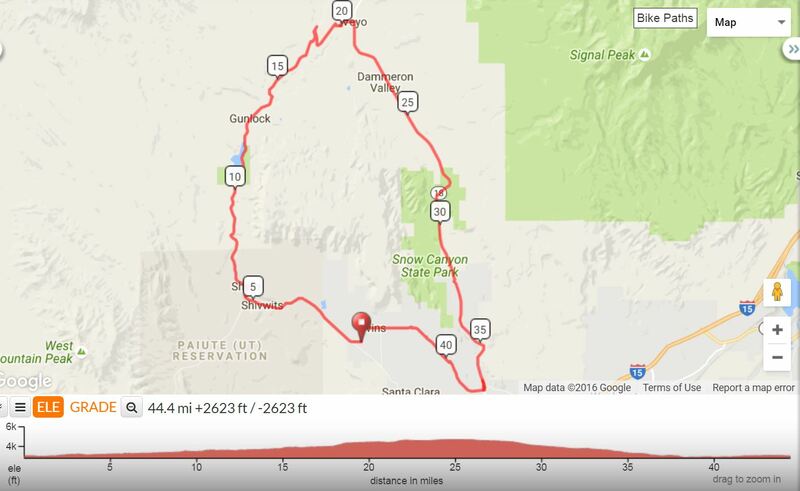 At Veyo, cyclists head south via state Route 18 toward St. George, then return to Ivins. The route is a popular training route for competitors in the Ironman 70.3 St. George and was part of the full Ironman St. George course. 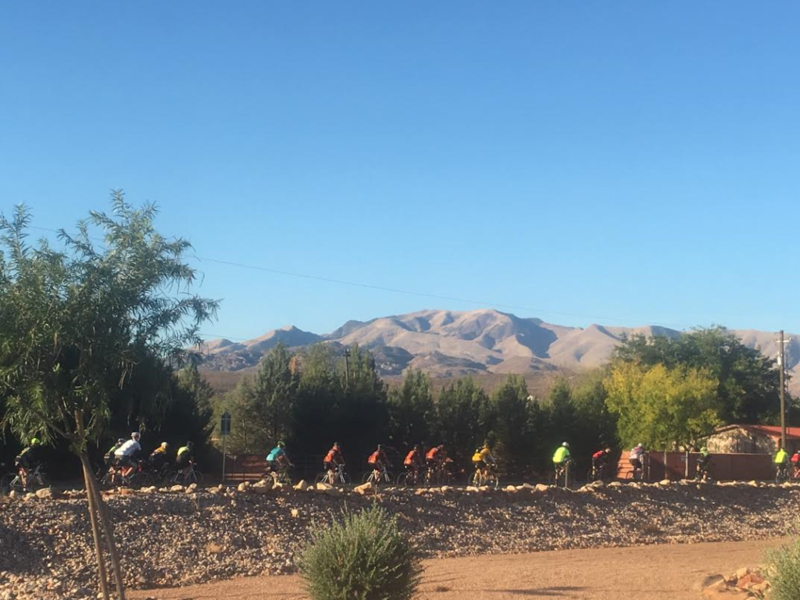 Riders love it not only for the challenge the route presents — particularly the climb out of Gunlock toward Veyo — but also its breathtaking scenery, Renstrom said. Another reason the route is popular is because of Veyo Pies, a signature stop along the route where cyclists can enjoy a piece of pie before continuing on their ride. “If you don’t stop and get a piece of pie or a cookie, you’re crazy,” board member of the Southern Utah Bicycle Alliance and passionate cycling advocate Marc Mortensen said. Riders can choose to ride the loop clockwise or counterclockwise and can make detours through the Kayenta development in Ivins as well as through Snow Canyon State Park. Signage has been placed along the route to guide cyclists who choose to take alternate paths, Reed said. Snow Canyon State Park is a fee area and cyclists should be prepared to pay the bike fee if they choose to cut through the park. 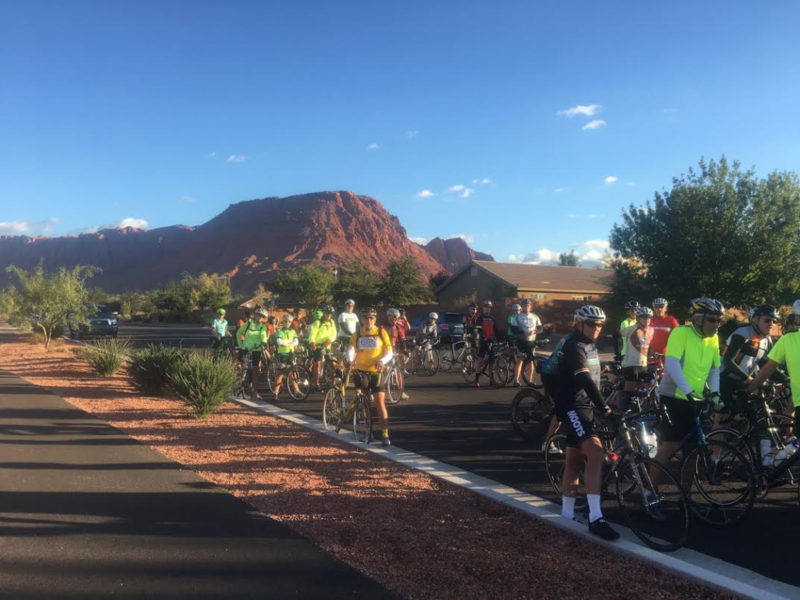 Cyclists in attendance at the ribbon-cutting received welcome news from Ivins Mayor Chris Hart who announced that improvements to the top portion of the road through Snow Canyon State Park have been approved. Among other things, the road, beginning from the point where the Whiptail Trail — the park’s paved cycling and walking trail — ends, the road will be widened to create bigger shoulders where cyclists can safely ride, he said. Ivins City received its designation as a “Road Respect Community” in 2014. Though Hart admits that he didn’t always have a strong understanding of the need to have a community that supports cycling, he is now committed to cycling and creating a safe community for cyclists to ride in. “We welcome you,” Hart said to the cyclists at the ceremony. More county bike route designations are in the works. This route is dangerous from the Shivwits Market most of the way to Gunlock. It’s not about “road respect,” it’s about physics. Slow bikes on a road with blind curves and no shoulder will result in cars and bikes attempting to occupy the same space at the same time. 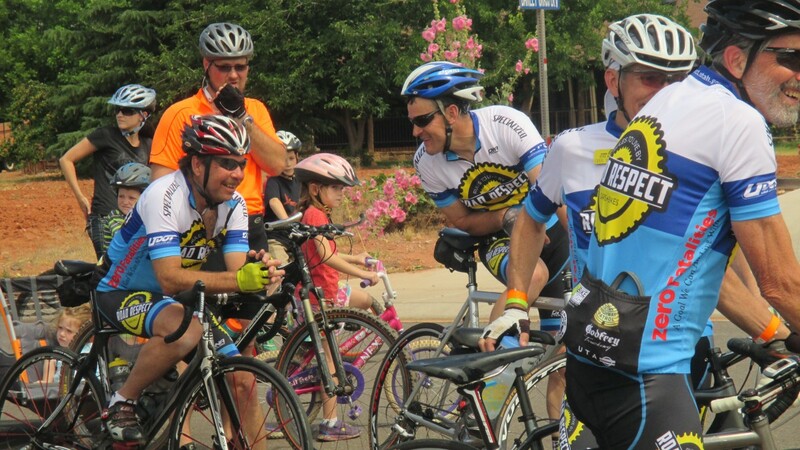 When they had the bike event last Saturday there were several close calls that I observed. Many of the biker’s also expressed anger about the route being unsafe. How much money was siphoned out of the ‘road fund’ to make those nifty new signs? How many potholes will not be filled now because the city decided ‘bicycle signs’ were more important than actual road maintenance? How many fees and taxes were collected from bicycle riders to pay for ‘their fair share’ of these new signs? How many tax dollars paid for the ribbon-cutting ceremony and event? Tell me again why the city needs to add a new tax to take money out of our pockets because these ‘essential services’ like bike route signs means there won’t be enough money left for ‘essential services’ like actual road work? Hey those tax dollars pay for Bob’s mental hygiene ya know ! I am disappointed that the three previous comment are very negative and obviously anti-cyclist. I agree that the route is unsafe. I was hit by a car on this route last year and spent 4 days in the hospital. The idea that this effort by the cities and county is a drain on resources is simply uninformed (and stupid). Tourism is our #1 industry and cycling is a big part of the industry. Just because you are not a cyclist doesn’t mean you have to trash an industry that supports so many in our community. I’d love to see the county and state make this route safer and I’m willing to spend the extra 1/4 of 1 cent to support the efforts to do so. Vote Prop 1 !!!!!! But are you willing to pay a bicycle registration fee? Are you willing to submit to and pay for a required yearly bicycle safety inspection? Are you willing to pay for required bicyclist insurance? This isn’t about being ‘anti-cyclist’, this is about using roads funds for the IMPORTANT stuff like road maintenance and improvements instead of spending it on non-vehicle projects. Bikes don’t pay for roads, yet the bike crowd is getting their ‘feel-good’ projects paid for, and then there isn’t money left over for the potholes, so the city says “pay more taxes now or suffer later”. Pay your ‘fair share’ and most of us won’t have an issue with the special bike paths and bike signs. As an avid cyclist, who has appreciated the SW Washington County system of trails and designated bike lanes, I have to consider that this designation is premature. While many sections of this route have wide shoulders, and in some cases even a designated walking/biking trail in parallel, the western reaches, past Ivins all the way up to Veyo, are sketchy. Salt Lake County, as an example, has continued to invest in improving shoulders, and modest signage, along local “favorites” for road bikers. The foundation of a good trail system is its infrastructure. I think this designation gives visitors to our region a false sense of the safety of travel. Those of us living here know that adding a few tastefully designed signs does nothing to reduce the risk of a bike/vehicle interaction.